With children taking communion before Confirmation now widely practiced in the Church of England, a fresh theological and practical exploration of Confirmation is both timely and welcome. This book will equip clergy, lay church leaders, youth workers and PCCs with a deeper understanding of the origins and theology of Confirmation, and of youth culture with its needs for rites of passage that acknowledge within young people an adult faith and an adult position within their church. It will enable churches to put Confirmation at the heart of youth discipleship. 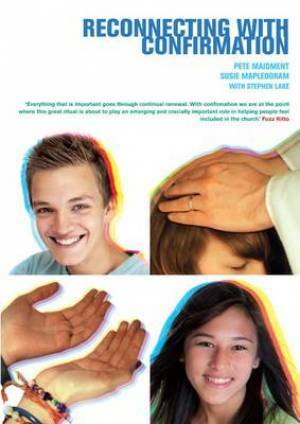 it provides:a clear and comprehensive history of confirmation and its place today,a holistic view of adolescence and faith/spiritual development that can inform how we approach and facilitate confirmation,a practical guide to creating the best confirmation experience for young people - from preparation, to the rite itself and beyond. Reconnecting with Confirmation by Pete Maidment; Stephen Lake; Susie Mapledoram was published by Church House in September 2010 and is our 26051st best seller. The ISBN for Reconnecting with Confirmation is 9780715142080. ‘Confirmation isn’t biblical’ (p.XV). ‘St Paul says The Holy Spirit comes upon someone when they are converted to Christ, Confirmation is not the receiving of the Spirit’ (pp143-4). If you agree with these assertions then this book may well be for you. If you don’t, then you may well find some of it problematical, as the Bishop of Bolton implies in his foreword. The authors seem to make a good case for confirmation as a rite of passage; and following their suggestions a lively one at that. But those who understand Confirmation as initiation will not find their beliefs endorsed in this book. Got a question? No problem! Just click here to ask us about Reconnecting with Confirmation.